He took time to answer my questionnaire. Thank you so much ! Nothing unique in my case, just becoming aware and intrigued by effects work by seeing movies like the 1933 “King Kong”. There wasn’t very much to read and learn about matte paintings, or film effects work when I was growing up, but I think that actually made it seem more exotic and rarified, and because of that, more interesting. – What is the best souvenir you have about your career, the matte you’re the most proud of ? That’s kind of tough to answer, because being so close to something allows you to see the flaws you hope others may not notice, and it’s hard to be non subjective. One particular shot I recall, though, is a shot of some kids looking out of a tent at night in a suburban backyard setting. I worked on with the Chiodo Brothers for their short film, “Cousin Kevin”, in 1985. I’ve always liked that one, it was shot in 16mm as an original negative composite. Really, the best part of my past experiences has got to be the people I’ve worked with, met, or become friends with. Getting to work as an assistant to Jim Danforth in the early 1980s was an incredible opportunity and learning experience. Later, I was able to work with some great people like David Stipes, Bob Bailey, Harry Walton, Steve, Charley and Edward Chiodo. I was very fortunate to get to work with Rocco Gioffre at a (now defunct) film effects company called DreamQuest, for a few years. Another fond memory is visiting the Universal matte department, in the mid 1980s. Syd Dutton very graciously spent an afternoon showing Rooco Gioffre and I all of the fantastic work he and Albert Whitlock had created there for many years. That was inspiring. 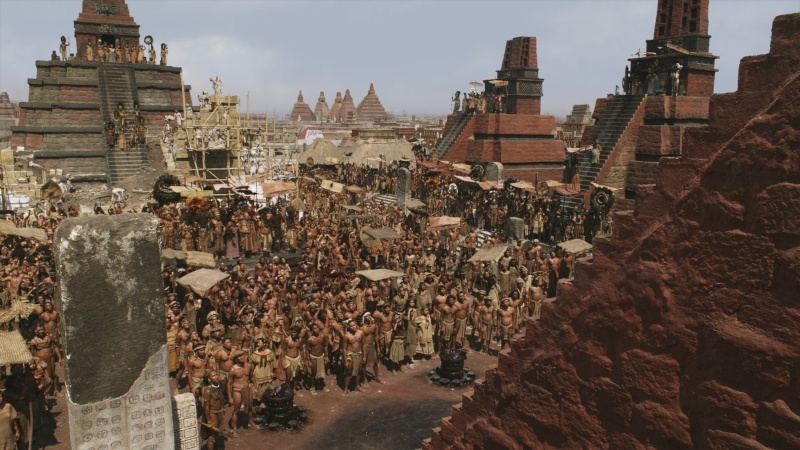 Here is a digital matte from “Apocalypto”. Sky, far horizon and some of the pyramids were painted in. The effects in the movie were supervised by Ted Rae. I painted on this shot for Rocco Gioffre’s company. – How did you manage the transition between traditional technique and digital ? At first it felt like being kidnapped, and taken to some other country you are unfamiliar with, and you have to learn a new language to live there. Really, though, it was fun learning to use Photoshop way back then. I didn’t start with doing much painting with it though, I was mainly creating images from collaging photos together. This was just fun, goofing around stuff, not film work. Input scanning and film recording was very expensive and kind of difficult at first. When Photoshop 3 came out, around ’94 I think it was, the layer capabilities made painting, and creating artwork from scratch much easier, to me at least. There was a peculiar clunkiness to some of my early digital paintings, -which I’ve since worked away from (cough). I think I was being too conscious of the new tools, and when I was working traditionally, my awareness of technique and tools seemed to be at a more subconscious, intuitive level, as I was only thinking about the image I was painting. Perhaps if a person that only had ever painted on the computer decided to take up oil painting at the age of 30, they might go through a similar experience. A stylized concept painting for “A Christmas Carol”. -How do you think matte painting evolved through the age in the sfx/vfx industry ? Do you think we use matte painting in the same way that before ? What might be interesting to consider is how little matte painting work changed for so long, before the computer entered the scene. On set or location glass paintings were probably not used as much in later years as compared to the 1920s, but most methodologies such as latent image and process projection remained in use right up to the mid 1990s. I love seeing the projection mapped moving CG matte shots as much as any one else, but one thing I question is the overuse of the swooping, flying camera matte shot, when it’s not really called for, or that relevant to the story. That’s hard to answer, because I’m not sure that I tend to be too nostalgic, or sentimental about the past, except for people that I miss that are gone. Yet, the traditional work is what made a huge impression on me when I was young, (it’s all there was to look at then, anyway) and there’s a lot from that pre-digital era, let’s say from 1922 to 1992, that still strikes me as great, inspiring work. Also, that’s an enormous chunk of time, so there is a tremendous amount to study and appreciate. So, I think my fondness for traditional work isn’t rooted in sentimentality, but it’s an appreciation of the quality when it was done well. Some people might not agree, but in a certain sense, I think the work was more difficult back then, or perhaps I should just say the results were less guaranteed. No undo command, no removable layers, no plug in filters, and YOU were the renderer! Sounds primitive maybe, but it forced you to be very decisive. Working on an acrylic matte painting for “Demolition Man”, 1993. The live action street and cars were exposed into the black area on the painting. – Did you prefer working for commercial or features films ? The fun thing about working on a feature film is that you get to share in the experience of seeing your work in the context of a story with a theatre audience. I’ve seen a lot of clever commercials that are memorable, so Ideally, it’s nice to go back and forth occasionally. 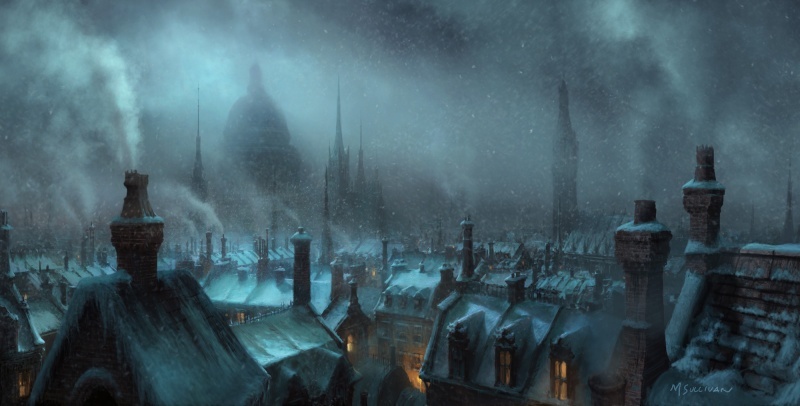 – What would be the most important things to do a great matte painting ? I tend to think those would mostly be the artistic considerations and decisions. Does the shot design convey the idea or statement of the shot? Does it match the look and feeling of the other shots in the sequence. Or most simply, is it an interesting or fun image to look at? – According to you, what is the limit of a matte painting ? Do you consider 3D environments as a matte painting ? When I see the term “matte painting”, I think of the work of people like Albert Whitlock, Peter Ellenshaw or Jim Danforth, -done with glass, paint and film. There’s a mental image imprinted in my mind from learning about matte paintings and film visual effects from the 1970s, so i might have a bias. I guess it doesn’t matter really. 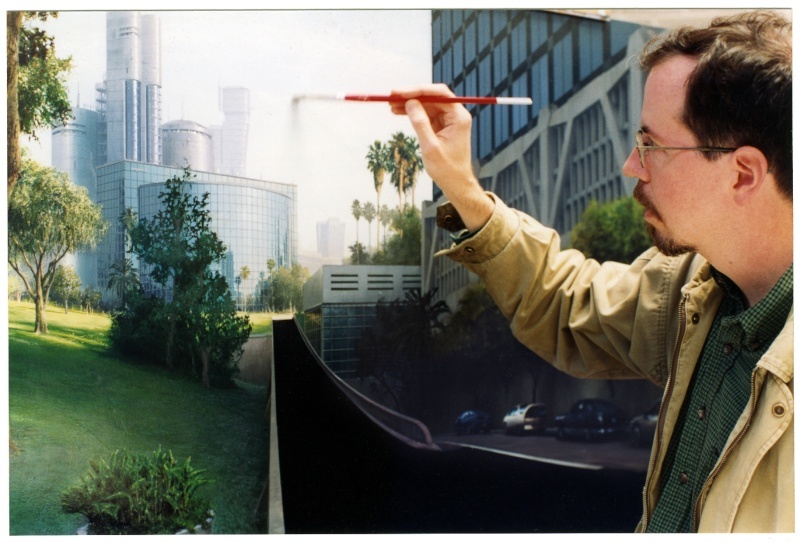 I know of a couple companies that call the digital artwork they use as backgrounds for their computer animation films “matte paintings”. That might be a misnomer, but I hate to be some cranky old geezer that gets worked up by those kind of things. They’re just terms and labels. I like the idea of using whatever gets the shot done the best way. 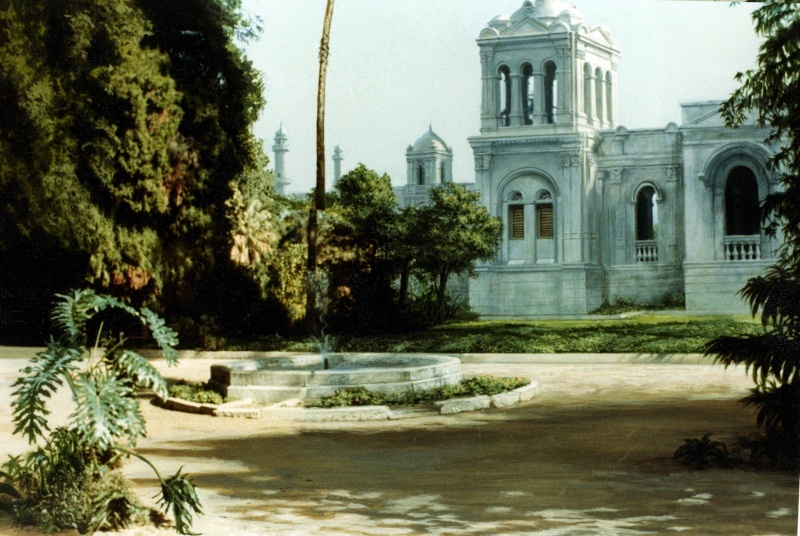 One of my very first matte paintings, for the television series, “Bring ‘Em Back Alive”, 1982. The work was done at Jim Danforth’s company. This photo was taken with a still camera, that was slightly off axis, -that is why the painted tree doesn’t line up with the live action trunk. This was a glass painting positioned in front of a rear projection screen. I like that Photoshop is starting to incorporate 3D. – According to you, is matte painting an art or a technique ? Oh, I would say matte painting is an art, much more than a technique. It uses a technology, like cinematography does, but like great cinematography work, it’s the artistic variables like the use of composition, emphasis, color and lighting that can make a big difference in the quality of the work. One thing that strikes me is that sometimes a lot of the newer work looks the same, as if a lot of it is done by the same individuals, at just a few companies, when I know that is not the case. People are generally using the same tools, and there is so much sharing and openness of technical information in books, magazines and the internet, -which can be a great thing of course, but maybe it allows for people following and emulating each other, more often. A lot of students I meet are very involved with copying other artists by following their blogs and tutorials. Copying can be helpful, but a lot of things are learned when you are working out problems on your own, and experiencing some failures, and trying to figure out what went wrong. Perhaps the wealth of information and tutorials to a certain degree stifles creativity and originality? I don’t really know, it’s a thought, or a rhetorical question. Thank you really much Mark for this interview.